Sartre had some grave defects. In his political impulses, he was mistaken with a rare obstinacy. Fairly cowardly during the Occupation, he turned into an Ayatollah of denunciations once the danger had passed, castigating his colleagues who did not commit themselves with all necessary blindness to Stalin, Mao, or Pol Pot. Along with an infallible instinct for error, he had a keen sense for any elevation of spirit, which horrified him, and, conversely, for any baseness, which attracted him. He was not wrong about Jünger: “I hate him, not as a German, but as an aristocrat . . .” Jünger was not an aristocrat by birth. His family belonged to the cultivated middle-class of Northern Germany. If he was an “aristocrat”—in other words, if he continually showed nobility and poise, moral and physical—it was not because he was born with a “von,” for that alone does not shelter one from baseness in one’s heart or deeds. If he was an “aristocrat,” it was not a matter of rank, but of nature. Heroic warrior in his youth, sensational writer of the “conservative revolution,” who then became a contemplative sage of sorts, Jünger had an exceptional life, traversing all the dangers of a dark century and remaining free of any stain. If he is a model, it is because of his constant “poise.” But his physical poise did nothing more than manifest a spiritual poise. To have poise is to hold oneself apart. Apart from base passions and the baseness of passion. What was superior in him always repelled the sordid, infamous, or mediocre. His transformation at the time of On the Marble Cliffs might be surprising, but there is nothing vile about it. Later, the warrior-botanist reinvented himself, writing in his Treatise on the Rebel that the age required recourse other than the schools of yoga. These are the sweet temptations that he now kept at bay. 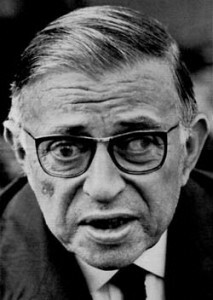 Jean-Paul Sartre, 1905 - 1980: An infallible instinct for error. A keen revulsion for every elevation of spirit. I have just written that Jünger was not an aristocrat by birth. I was wrong. He was. Not by family origin, but by a mysterious inner alchemy. In the manner of the little girl and the concierge in Muriel Barbery’s novel The Elegance of the Hedgehog (L’élégance du hérisson, Gallimard, 2006). Or in the manner of Martin Eden in Jack London’s novel of the same name. Born in the depths of poverty, Martin Eden had a noble nature. Mere chance puts any young person in a refined and cultivated milieu. He fell in love with a young woman who belonged to that world. The discovery of literature awoke in him the vocation of writer and a fantastic will to overcome himself, to completely leave his past behind, which he accomplished through tremendous ordeals. Having become a famous writer, he discovered simultaneously the vanity of success and the mediocrity of the young bourgeois woman whom he thought he loved. Thus he committed suicide. But that does not affect my point. There are Martin Edens who survive their disillusionment, and there always will be. They are noble, energetic, and “aristocratic” souls. But for such souls to “break out of the pack,” as one says of good hunting dogs, and rise to the top, role models are absolutely necessary. Living exemplars of inner heroism and authentic nobility down through the ages constitute a kind of secret knighthood, a hidden Order. Hector of Troy was their forerunner. 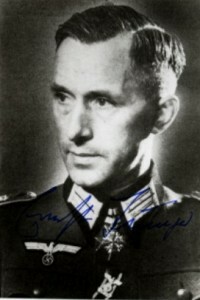 Ernst Jünger was an incarnation in our time. Sartre was not wrong about that.